Knuffle Bunny… even if Easter is already gone. Easter came and went, but we’re still in the mood for bunnies and treats! We made these super easy brown sugar shortcake cookies with Easter motifs, and we wanted to share! And to pair up with these very simple cookies, we got our favorite bunny to go with them: Mo Willem’s Knuffle Bunny. This mixed media picture book tells the story of toddler Trixie, who goes with her Daddy to run an errand at the Laundromat… and that’s when things start going horribly wrong as she and her Daddy leave Knuffle Bunny, Trixie’s favorite friend, behind. Trixie can’t talk, so she does everything she can to let her Dad know Knuffle Bunny is missing. 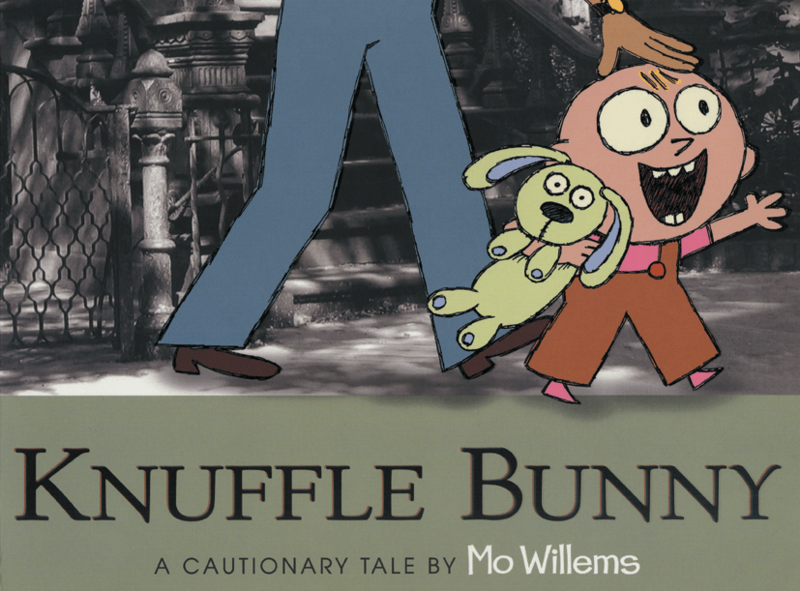 This book has Mo Willems’ same simple but poignant style, always speaking to children on the things they care about most. When I first read this book was when my daughter was very little and she had her very own “Knuffle Bunny” — a white blankie with a lambie’s head. All the things that Trixie does to try and tell her Dad how distressed she is are things that both my daughter and son (and I bet any other child beginning to talk) goes through. So it does strike a cord with both parents and kids alike. This book won the Caldecott Award, and there’s a second book on Knuffle Bunny when Trixie is older, but I haven’t read that one yet. I recommend this book wholeheartedly, and I can safely say it is one of the favorite ones out here at our home. As Knuffle Bunny is not a very well known Bunny for the Easter roundups, I think it should be better known and included. Now, for the cookies. Miss I wanted to make and decorate cookies badly, and I wanted to find a good recipe for shortbread. Following is our collaboration together! We used Wilton’s candy decorating pens and white icing. Miss I has been obsessed with Song of the Sea since we saw it a few weeks ago, so all her drawings were within that theme. You can see her cookies after the recipe! Preheat the oven to 350ºF, with the rack in the middle rung. In an electric mixer, beat the sugar and butter until well incorporated. If you want a lighter cookie, you can use white sugar. Once the butter is pale and the mixture is fluffy, add the splash of vanilla and the pinch of salt. Add in the flour, until the entire mixture is homogeneous, then gather it up on a ball, put it on a sheet of plastic wrap and press it down to a large disk. Wrap the dough up and put it in the fridge for 30 minutes to firm up. Once your dough is cold enough, roll it out on a lightly floured surface to a 1/2" thickness and cut out your shapes. Place them in a cookie sheet about an inch apart. I rolled mine to 1/4", but they were too thin for my taste. Bake them in the oven for about 15 minutes, until they are cooked through and lightly brown on the edges. Cool them on a wire rack and once they are cool enough to handle, you can decorate them. If you don't want to decorate them, they are just delicious with nothing on top. 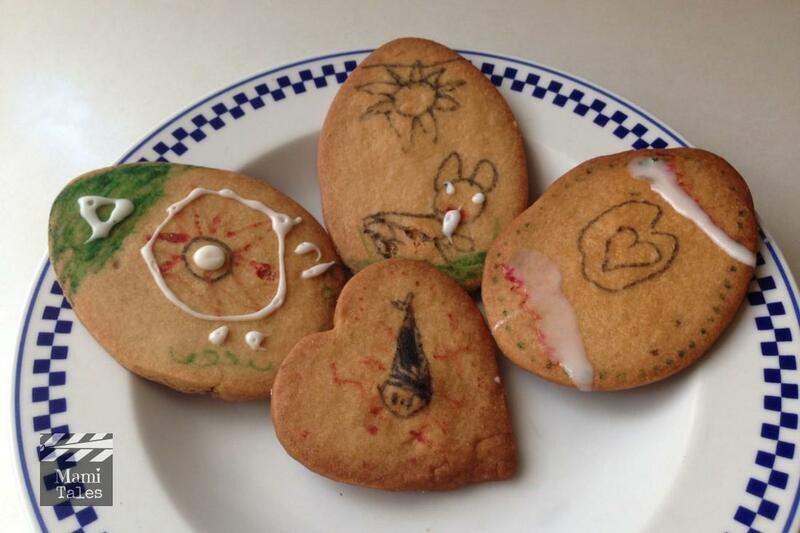 And well, as promised, here are Miss I’s egg shaped cookies, decorated. What is your favorite Bunny storybook? Share with us! Tagged Book reviews-recipes, Cooking with Children, Desserts, Family. « Mami Tales First Anniversary!